Any time I can come up with an excuse to serve Chili Cheese Fritos for breakfast (or lunch, or dinner), I’m in! Frittatas are also one of my family’s favorite meals–we actually have them more often for dinner than breakfast, because they’re just so easy to throw together on busy week nights or lazy weekends. You could certainly add meat–sausage would be great–or other vegetables to this dish. That’s one of the many things I love about frittatas. You can add all kinds of leftovers and odds and ends. And of course, Chili Cheese Fritos make everything better! In a large bowl, whisk together the eggs and hot sauce, along with a dash of salt and pepper; set aside. Preheat broiler. In a large ovenproof skillet, heat the butter over medium heat until melted. Add the onion, peppers, and garlic and cook for 3-4 minutes. Stir in the chopped tomatoes and cilantro. 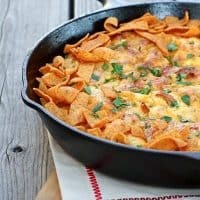 Lightly crush about 1 1/2 cups of the Fritos and add them to the pan. Pour in the egg mixture and cook until the edges are just starting to set, about 7-10 minutes. Remove from heat and sprinkle with cheese. Carefully place the skillet under the broiler and cook for another 3-5 minutes until the top of the frittata is set and golden brown. Garnish with additional Chili Cheese Fritos, then cool a few minutes before slicing and serving. Printing this out for Joe now! Saw this on Instagram the other day and almost died. This looks sooo good. When I was a kid I loved the frito chili thing at Sonic. I’ve to make this to bring back some of the memories! I will take one of these for me, and one for hubby! I don’t know who you are, but you are a genius! I’m definitely trying this. I think Frito’s are highly underrated. 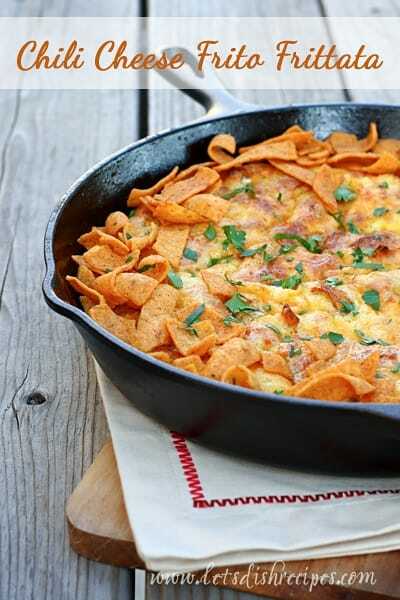 Melted cheese and Frito’s?? Brilliant! Are you kidding me? This looks amazing!!!!!! I’m in love and I can’t wait to try this! I love chili cheese Fritos and you’ve elevated it into something even more incredible. I’ll have to give this a try! My dad would’ve loved this. Too bad hes not with us any more. I think this would go great with his favorite snack, cheesy baked potato.